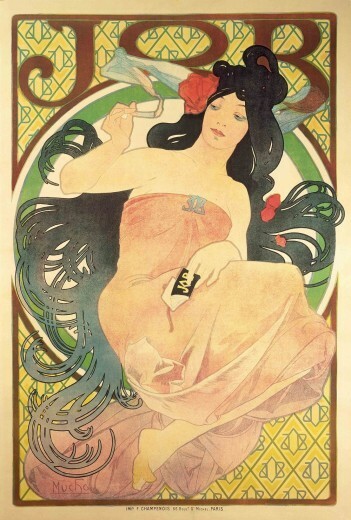 In this poster, Mucha’s stylised depiction of hair, known at the time as macaroni or vermicelli, is both decorative and sensual. With her curled up toe – a symbol of female sexual arousal – and the raised tip of her cigarette, Mucha produces a sexually charged poster. The clasp which holds the woman’s dress together, based on the Job monogramme, draws the eye of the viewer to her chest.